Having finally identified Johnny To to be the one Hongkong director to pay attention to, I am working my way (slowly…) through his back catalogue. 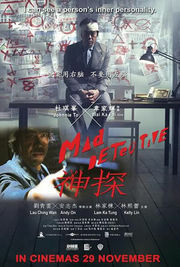 So after the splendid “Drug War” I took on 2007’s “Mad Detective”. Not knowing what to expect, merely approaching it through the name of the director. And what a stunning surprise that holds… it is (of course) about police corruption and organised crime and brutal killings. But it is also about a weirdo police detective who tortures dead pigs, then himself by asking to be locked in a suitcase, later cuts off his ear so he can give it away as a token. It’s a while ago now that I saw this, but there are some vivid memories of meetings and shootings in the woods, about Detective Bun staggering and running around a world that he mostly shuts out from his stream of inspiration, a whole society of multiple personalities populating a dark world … It is a crazy and twisted film, but in the competent hands of To and Wai, I almost never lost track of what was going on (I was particularly proud of that given that some people are actually represented by as much as eight actors…). While it does not have the narrative density and punch of “Drug War”, it is another example of edgy and innovative film making out of Hongkong by maybe the one director who is consistently terrific.